Oren Lyons explains the Two Row agreement at the Russell Tribunal at the Hague in 1980. 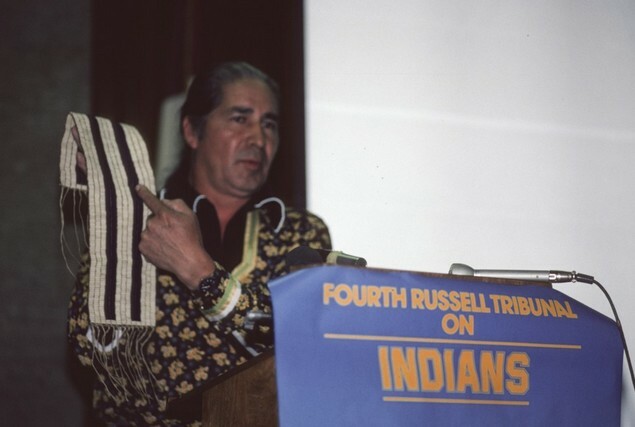 On Friday, September 13, 2013, Haudenosaunee leaders will participate in a ceremony to honor the 400 year old Two Row Wampum Treaty between the Haudenosaunee Confederacy and The Netherlands. The ceremony will be held at the Tree of Peace which was planted by the late Mohawk elder Jake Swamp at Wijkpark Transvaal in The Hague, The Netherlands, in September 2006. Alifuru people (from what is now called Indonesia) residing in The Netherlands will lead the ceremony at the Tree of Peace.